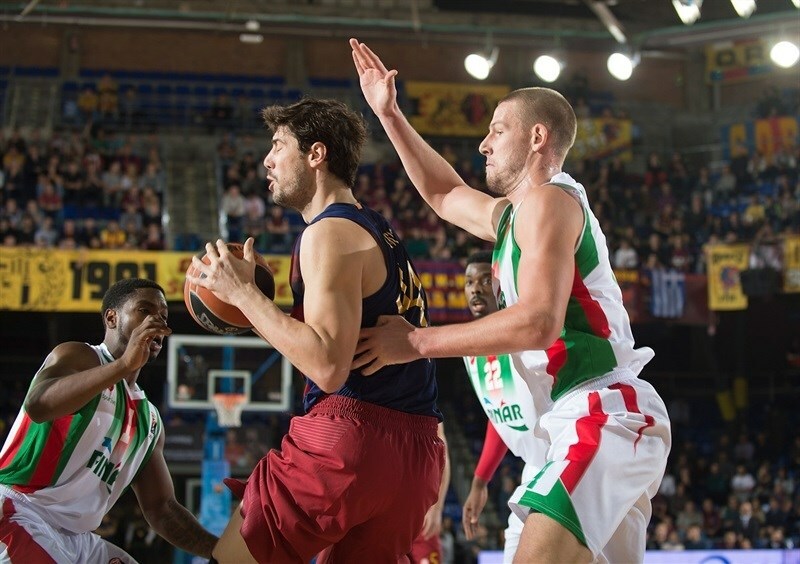 FC Barcelona Lassa registered its fifth consecutive win in Group C by thrashing Pinar Karsiyaka Izmir 107-79 at home on Thursday. Barcelona broke its team scoring record in the competition - it had previously scored 104 points against PGE Turow Zgorzelec in 2014 and against Cibona VIP Zagreb in 2003. Barcelona improved to 5-1 and has defeated every opponent in the group. Karsiyaka dropped to 2-4. Shane Lawal led the winners with 19 points. 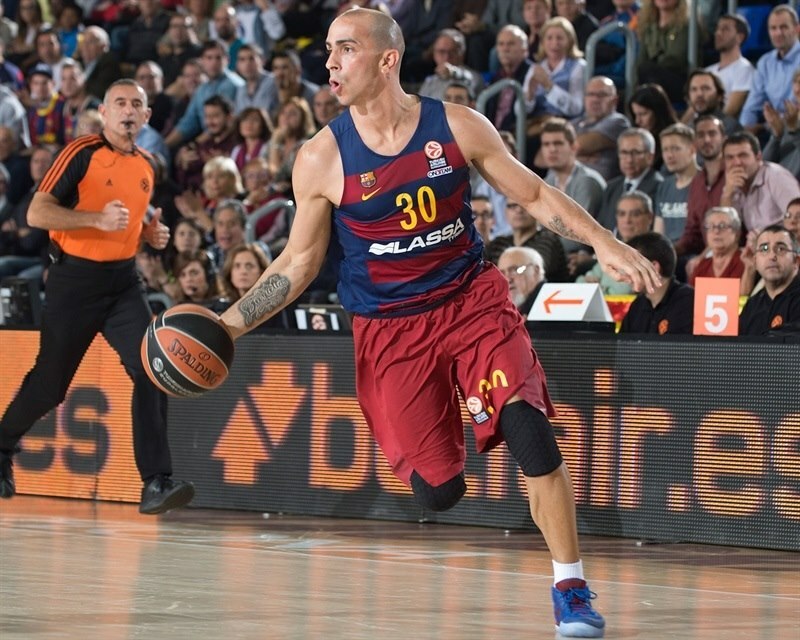 Carlos Arroyo added 18 on 6-of-7 three-point shooting, Ante Tomic scored 16, Justin Doellman 14 and Juan Carlos Navarro contributed 10 for Barcelona. Joe Ragland led all scorers with 26 points. Kenan Sipahi added 13 while Kenny Gabriel had 10 for Karsiyaka. Ragland shined early to give Karsiyaka an 8-10 lead. Doellman and Arroyo stepped up to give Barcelona get a double-digit margin, 26-16 after 10 minutes. Arroyo buried a couple of threes early in the second quarter, but Kerem Gonlum and Gabriel got Karsiyaka a bit closer, 36-31. Brad Oleson and Tomas Satoransky helped Barcelona restore a 48-37 margin at halftime. Nothing changed after the break, as Barcelona kept finding good shots all over the place, boosting its margin to 79-57 after three quarters and sealing the outcome long before the final buzzer. 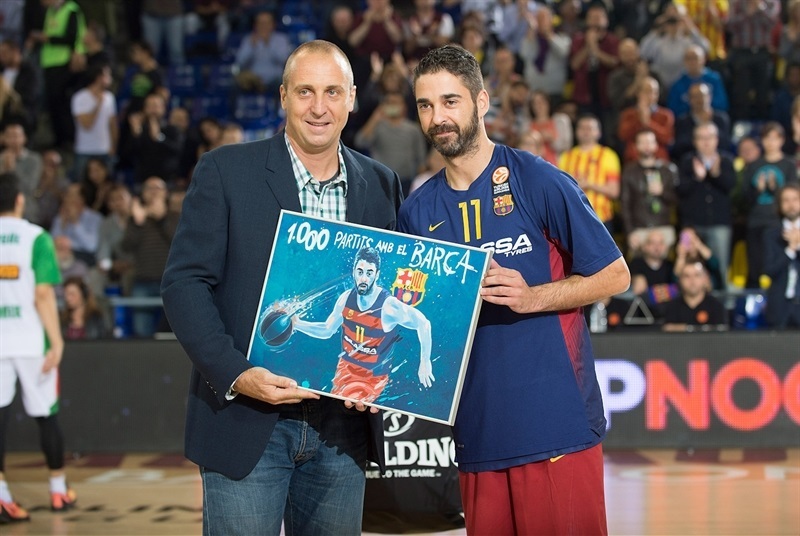 In a pre-game ceremony, Barcelona honored Navarro for reaching 1,000 official games with the club. In honor of all the victims of terror from many countries throughout Europe and beyond, a minute of silence was observed prior to the game. 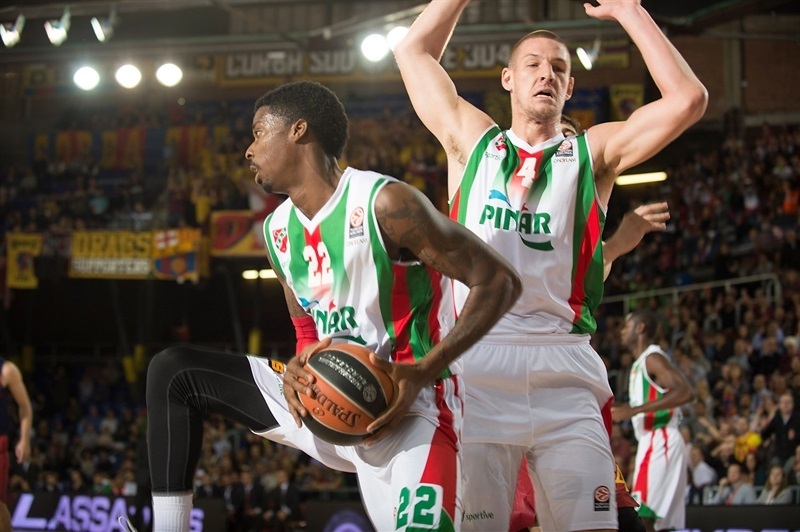 Navarro got Barcelona going with a three-pointer and a layup by Colton Iverson kept Karsiyaka within 3-2. Stratos Perperoglou also struck from downtown. Gabriel stepped up with a put-back basket and a three-pointer by Joe Ragland gave Karsiyaka its first lead, 6-7. 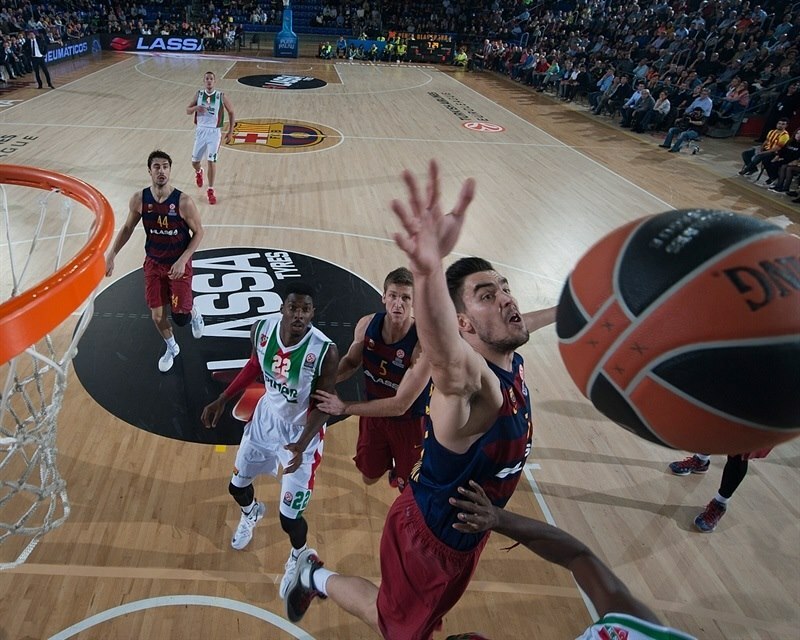 Tomic dunked, as Barcelona kept trying to run the floor to find easy points in transition. Ragland kept pacing the guests with a driving layup and a free throw by Iverson gave his team an 8-10 lead. 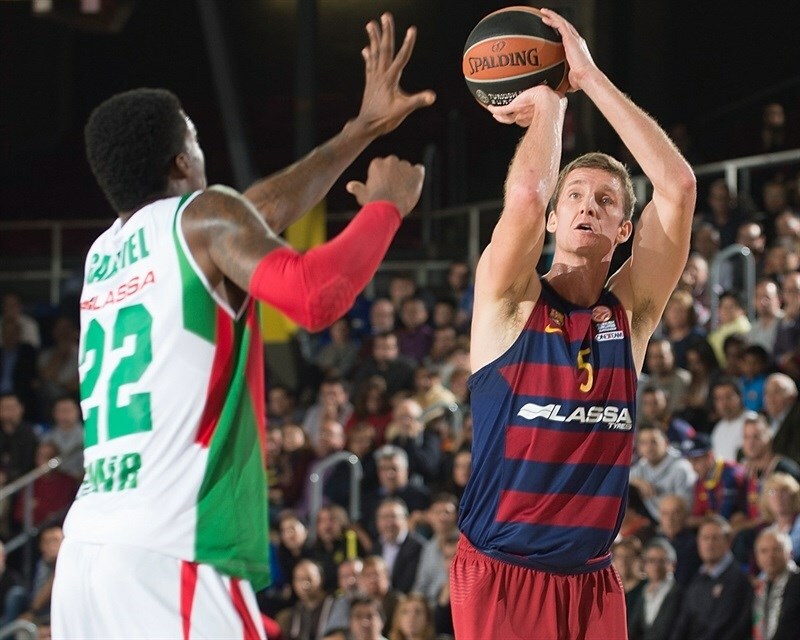 Doellman shined with a two-handed slam and Tomic followed a fast break layup with a tip-in for a 14-10 Barcelona edge. Ragland took over with consecutive layups, but Doellman scored around the basket and Arroyo buried a three-pointer to give their team a 19-14 lead. Navarro hit his trademark bomba and Doellman banked in a close shot to cause the guests to call timeout at 23-14. Ragland scored again and a triple by Arroyo gave Barcelona a double-digit lead, 26-16, after 10 minutes. Gonlum scored in the paint early in the quarter and Gabriel had a big block on Alex Abrines. Arroyo sank his third three-pointer, which an unstoppable Ragland erased with a layup-plus-foul. Arroyo buried another one from downtown and fed Lawal for a wild alley-oop dunk that boosted the hosts' lead to 34-21. Gonlum stepped up with a layup, which Gabriel followed with a wide open triple that caused Barcelona to call timeout at 34-26. After Lawal made free throws, Gabriel buried another three-pointer and a layup by Gabriel brought Karsiyaka within 5. 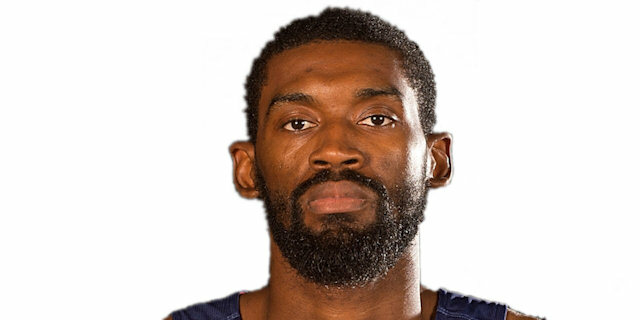 Lawal insisted from the foul line and a three-pointer by Brad Oleson gave Barcelona a 41-31 margin. 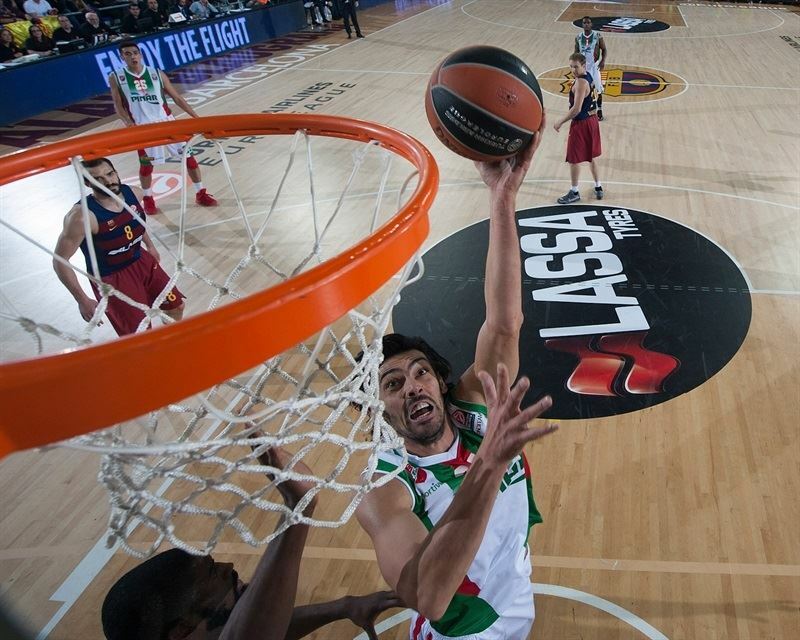 Mohammed Baygul and Tomic traded baskets and an off-balance basket by Iverson kept the guests within 43-35. After Satoransky nailed a rainbow triple, Iverson made free throws and a jumper by Pau Ribas fixed the halftime score at 48-37. Arroyo buried his fifth three-pointer in as many attempts immediately after the break. Kenan Sipahi split free throws and a layup by Ragland kept Karsiyaka within 51-40. Cal Antintig also scored off a steal, but Tomic did better with a three-point play for a 54-42 Barcelona lead. 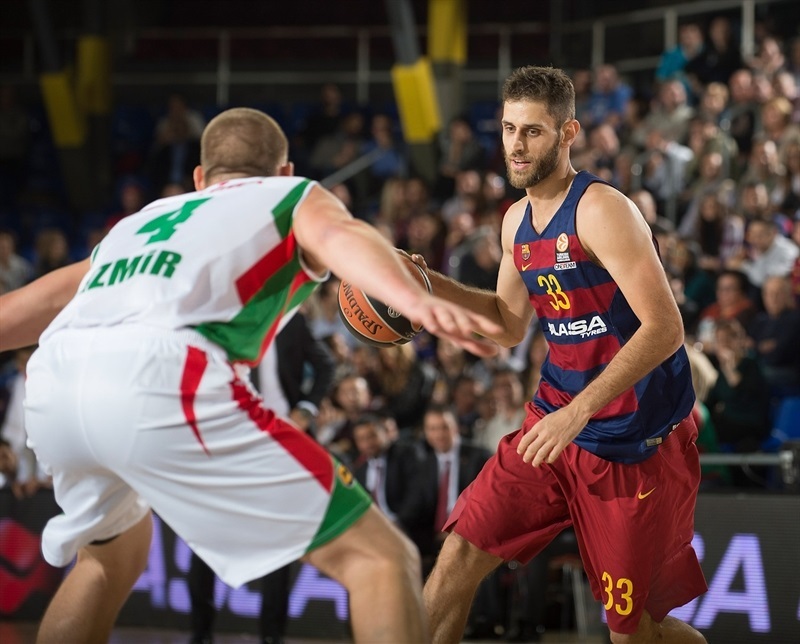 Sipahi struck from downtown and a three-point play by Perperoglou gave Barcelona a 57-45 margin. Ragland hit free throws, but Tomic split attempts and a stop-and-pop three-pointer by Navarro gave Barcelona a 14-point lead. Tomic shined with an alley-oop dunk but Sipahi hit a jumper and improved Navarro's 'bomba' with a three-pointer. Samardo Samuels followed foul shots with a slam and free throws by Josh Carter kept the guests within 69-55. Tomic scored down low and Samuels made it a 17-point game. Satoransky took over with a fast break layup. Gabriel made free throws before Doellman and Lawal boosted the hosts' lead to 79-57. Lawal dunked again early in the quarter, but Ragland did better with a three-pointer to keep Karsiyaka within 81-60. Satoransky scored in transition and Doellman erased Egemen Guven's jump hook with a five-meter jumper. Lawal kept pacing Barcelona with an alley-oop slam that forced Karsiyaka to call timeout at 87-62. Baygul buried a mid-range jumper, but so did Ribas and Sipahi. After Abrines hit an off-balance three-pointer, Baygul and Doellman traded free throws and even after the outcome was clear, both teams kept scoring fluently. Lawal dunked again and Doellman added a fast break slam to make it a 30-point game. Lawal and Samuels kept pushing Barcelona to a new team scoring record as the fans celebrated another victory. "We are happy with the game we played today. We played well all-around, especially on offense, scoring a lot of points in all four quarters. We played with a high rhythm, intensity and managed to break the game open in the second half. We had the option to get a bigger lead at halftime, but missed that, But we broke the game in the third quarter and finished with a high score for us, against an opponent that played well, despite its injuries. They scored 79 points and some of them came against some good defenses. I am happy with this win, which erased the loss we had in Izmir. 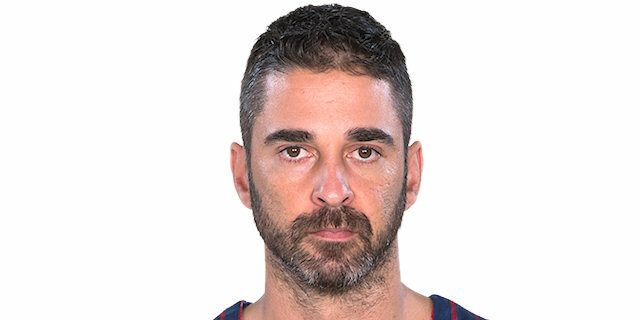 I want to congratulate Juan Carlos Navarro - playing 1,000 games with this jersey is an unbelievable number. 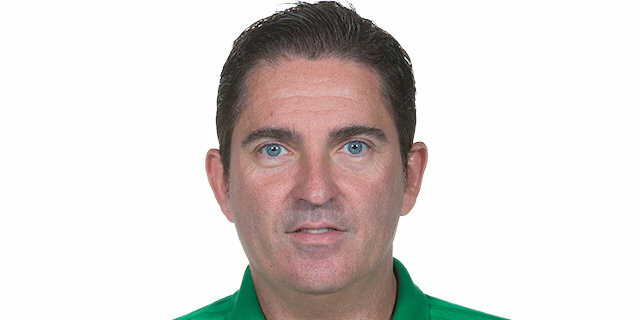 I want to congratulate him for today's game, too; He helped us a lot. He is a one-of-a-kind player who will possibly never be repeated. We had the luck to enjoy him. It is a night in which we have to be satisfied for his number, our 251st win in the Euroleague and the club's scoring record." "Our defense was the key to this loss. We should have played stronger defense because we are playing a road game in the Euroleague. We cannot allow anyone to score so many points in each quarter. We didn't manage to play good defense tonight. If we had won tonight, it would have been big news, something extra in our plans. I am looking forward to bringing our injured players back in the team. The Euroleague is a strong competition and we don't have the rotation we wanted and that is giving us trouble. I hope they can be back as soon as possible. We are playing strong games in both the Euroleague and the Turkish League these days. We have to forget about this loss and think about our next Euroleague game, hopefully with our injured players back in the team. I want to thank all our fans who supported us tonight. We count on our fans’ support, at home and on the road. It is very special, our fans are everywhere and it is the first time we play in Barcelona, which was a dream a few years ago." "Truth to be told, we played a very good game on offense. The team is getting better and better, but we must start thinking of the next game. We have a deep team with a lot of rotations and whoever comes off the bench plays very well. There is a long road ahead of us and we have to play well at the right time, especially in 2016, but it is good to start like this. It feels good to have played 1,001 games with this jersey. I am still around as an important player. I am happy with those numbers and hope to play some more." "It was a good win for us. They were missing two key players, but we did a good job, playing hard at both ends, playing good basketball on offense and defense, running the court and getting stops. We have to keep getting better; we cannot get worse. There is a long season left in the Euroleague."